Apalachin, NY, September 15, 2017 – Faced with a shortage of soil to cover their daily intake of waste; and an increasing supply of waste latex paint, the Mesa County Colorado landfill looked to LSC Environmental Products for help. Working closely with LSC in 2014, the county applied for and was granted regulatory approval to combine their waste latex with LSC’s spray applied Posi-Shell® technology, and over the past year, the innovation has preserved valuable landfill airspace, dramatically reduced expensive and disruptive on-site earth moving operations, and eliminated costly paint disposal fees for the facility. Jennifer Richardson, a compliance manager for Mesa County commented that “The air space we saved last year by using the (Posi-Shell®) slurry, instead of soil, is about $1.4 million dollars.” The facility now completes in 30 minutes what once took several hours with several pieces of expensive heavy-equipment. Mesa County has also saved over eleven thousand dollars in paint processing and disposal fees over the past year, and expects to double that figure in 2017. The creative solution earned Mesa County, the North American Hazardous Materials Management Association’s (NAHMMA) Program Innovation Award and since receiving the award, Richardson has fielded inquiries from solid waste managers from as far away as New Zealand. “My phone has just been blowing up,” she said. 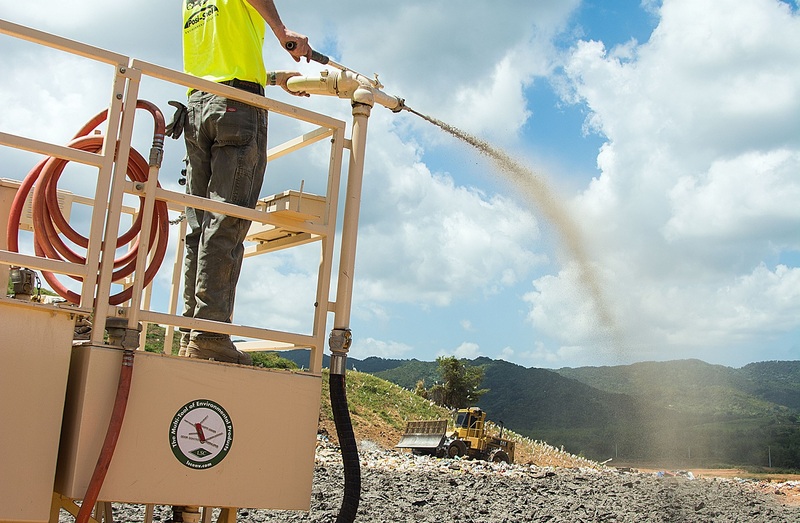 LSC is a global manufacturer of premier products and equipment designed to address the persistent environmental challenges of erosion, odor, land reclamation, waste cover, seeding, and dust. Over 28 years ago, LSC pioneered the use of spray-applied alternate daily cover and solar-powered vent flares in the solid waste industry. Since then, they have applied their unparalleled expertise in spray-applied environmental coatings to a variety of new products, industries, and markets. LSC’s product offering also includes a full line of specialty mixer/spray applicators. Posi-Shell is a patented blend of water, clay binders, reinforcing fibers, and polymers that are spray applied and dry as a thin, highly durable stucco.